Olympiakos coach Oscar Garcia holds his face. The Greek Superleague game between leaders PAOK Salonika and Olympiakos was abandoned on Sunday before kickoff after Olympiakos coach Oscar Garcia was hit by an object thrown from the crowd. The former Watford boss was struck in the face, reportedly by a toilet roll, and the teams left the field as he received medical attention before being taken to hospital. Olympiakos wrote on their website: "The coach of our team was hit by an object that was thrown [by] PAOK's fans and our team left for the locker room. "Mr. Garcia left Toumba for a hospital in Thessaloniki so that he could take the necessary examinations." The Associated Press reported that the private clinic where Garcia was taken issued a statement about five hours after the coach was admitted, saying his upper left lip was swollen and skin on the inside of his mouth was injured. "He has sensitivity in the jaw, neck pain, dizziness and nausea," the clinic statement said. Garcia was scheduled to stay at the hospital overnight. No away fans were allowed at the game and PAOK supporters were unusually well-behaved ahead of kickoff. The often seen spectacle of flares creating a wall of thick smoke was absent. 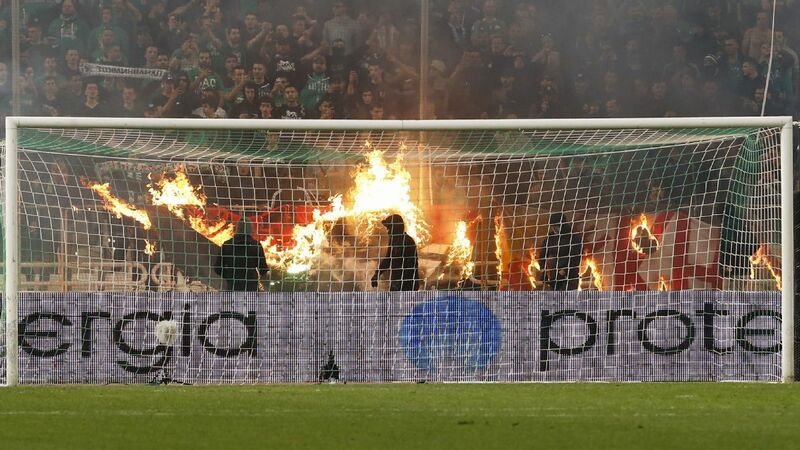 PAOK communications chief Kyriakos Kyriakos reportedly blamed the incident on Olympiakos. "This is a shadow play, a strategy that Olympiakos started implementing even ahead of the game, fantasising about [incidents] in its friendly media," Kyriakos said, according to The Associated Press. PAOK lead the standings by two points from AEK Athens, with Olympiakos a further four points back in third. Olympiakos also faces a deduction of three points for fan behaviour last month. The club has already been deducted those points, but is appealing the sentence. Pending appeal, the standings do not reflect the sentence. A loss of those three points and with eight rounds remaining would essentially scuttle Olympiakos' hopes for a 20th league title in 22 seasons. But sanctions against PAOK, together with a successful appeal, would complicate the odds.